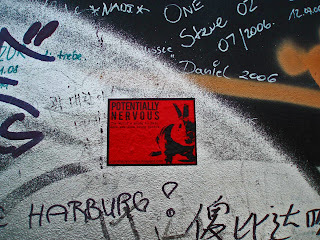 potentially nervous: detail of PN on the berlin wall....who loves ya jules???? detail of PN on the berlin wall....who loves ya jules???? Hell yeah! That's where I heard about this website! The world really is going to hell, so it's amazing how pictures of bunnies can bring us all together. I live in Phoenix, Arizona. If I weren't so hot outside I would get a bunny to take pictures of. Did you know that jackrabbits grow as big as medium sized dogs? I used to have a rabbit named Oreo when I lived near Spokane, Washington, but it ate something poisonous and died. Very sad... I wonder if I have any pictures lying around.